summer love, originally uploaded by skwadra. Wish i could say that this pic’s from today 🙂 It has been a very grey day here in Sweden. Really need some Sunflowers! That’s one thing I love about photographs, you can just check them out and feel the warm summer breeze, feel the scent of sun-warmed soil, pine and jasmine. 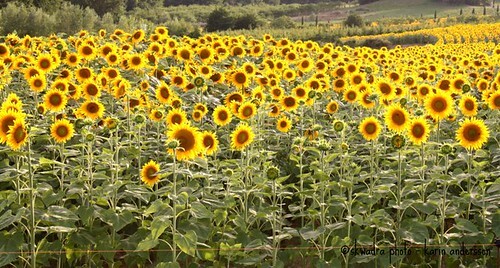 This field of sunflowers I found just outside Figline Val D’Arno, in Tuscany. Can you feel the warm breeze?